For a constitutional republic to maintain a healthy balance of power, a steady stream of newly elected officials is essential. But what happens when these office holders disregard or openly defy the will of their constituents? In theory, they would get removed from office. Elections are designed to be the check and balance. The idea is to simply vote out the elected officials who no longer represent your interests with someone who does. So why did 95 percent of Congress win reelection in 2016 with an approval rating of 14 percent? In the early days of our nation, the political machines as we now know it didn’t exist. Citizen legislators had few perks or financial incentives for staying in office, let alone making a career out of it. Fast forward to today. We’ve seen the financial incentives of holding Congressional office and cost of a campaign running for it rise dramatically. Money has taken over much of the electoral process, sharply increasing the amount of funds required to win an election. Well-intended reforms have had unintended consequences. For example, when the primary electoral process was first instituted, the purpose was to shift power away from the political elites and into the hands of the average voter. Unfortunately, adding primaries extended the election cycle, significantly increasing the need for additional funding. Everyday citizens looking to run for office now face a financial burden that is seemingly insurmountable when going up against a well-funded incumbent. According to recent studies by Rasmussen and the Center for Responsive Politics, congressional incumbents enjoyed a 95 percent reelection win rate while also outspending their challengers 8-to-1 on average. Combine this financial advantage with the advantage of name recognition and, generally, if congressional incumbents run for reelection, they have a great chance of winning. The study also averaged how much a winning seat to Congress cost in 2016. 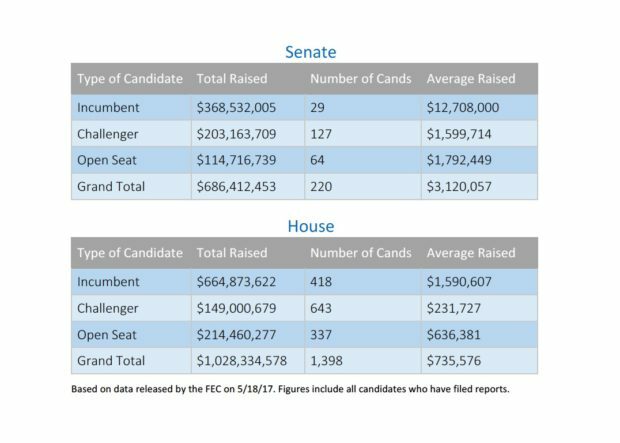 The average winning House candidate spent $1.3 million, while the average winning Senate candidate spent $9.4 million. It is important to note that incumbency is not inherently bad if lawmakers are serving their constituents well. Furthermore, despite the abuses of campaign finance, money in campaigns is not inherently bad. Funding large-scale outreach efforts requires sufficient financial resources. However, when such large amounts of campaign funds are used as a reelection insurance policy for career politicians, it prevents constituents from staging a reasonable challenge to power. The current situation presents a serious dilemma. Political elites have found a loophole in the check-and-balance system of government. If members of Congress can enrich themselves by working on behalf of large special interest groups without any real risk of losing reelection, is there any check or any balance left? Over the last century, Congress has gone from being a watchdog of capitalism to being a caretaker of unbridled corporatism. We must regain control of our government. We must restore America’s constitutional republic, in which we are governed by the will of the people, not the wealth of the politicians. To do this, we must work harder than ever to pay close attention to the actions of our elected officials, not just their rhetoric. It starts with organizing and informing our communities. There is no accountability without action. And most importantly, the real fight begins with good men and women stepping forward to run for office, who will stand on principle and defend America’s greatness. Josh Wagoner is a co-founder of Tomahawk Strategies, a conservative political consulting firm based in Oklahoma City. Follow Josh on Twitter.